Made of sturdy yet flexible food-grade silicone, these measuring cups pour liquid precisely with no spills. The design allows you to form a spout anywhere on the flexible rim and the silicone material grips the counter to provide traction and stability. Measurement level indicators are clear and easy to read for precise measuring. Dimensions (in packaging): 7.1" x 4.8" x 4.8"
Recommend...very handy, durable. Especially useful for bakers. These are awesome! Very happy with this purchase!! Super idea that works ! 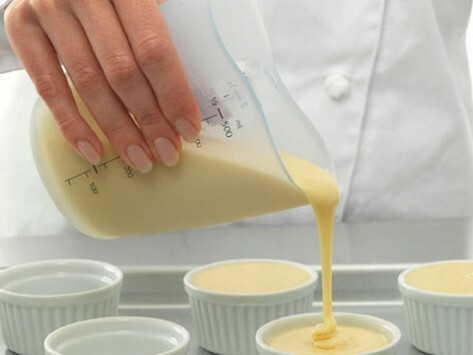 If you rarely come out of a cooking experience unscathed, these flexible measuring cups are just what the baker ordered. They’re made of food-safe bendable silicone. Here’s why that’s so nifty: you can pinch the rim to form a spout, then pour with total precision. It makes less mess, particularly when you’re pouring directly into a narrow space, like a food processor chute. And their rubbery texture is easy to grip, too. These moldable measuring cups are designed to handle any temperature—from boiling hot liquids to ice-cold water. The outside stays safe to touch. Another benefit to the silicone design—it won’t break down in heat or react with certain foods. From amateur bakers to everyday cooks, these cups make measuring, pouring, and prepping a piece of cake.